Standard and compact P320 MHS. Illustration courtesy of SIG SAUER. 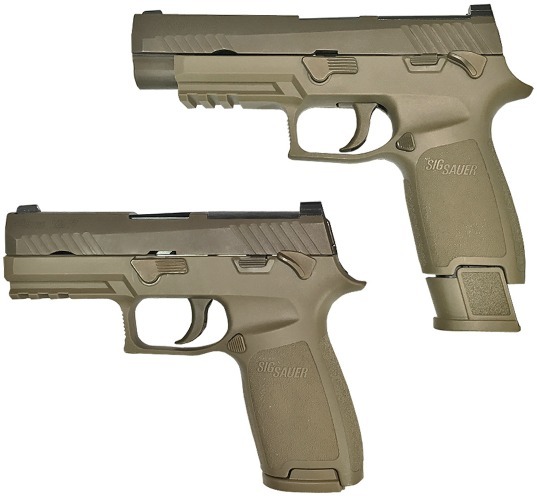 SIG SAUER, Inc. announced today that the U.S. Army has selected the SIG SAUER Model P320 to replace the M9 service pistol currently in use since the mid-1980s. Released in 2014, the P320 is a polymer striker-fired pistol that has proven itself in both the United States and worldwide markets. The P320 is the first modular pistol with interchangeable grip modules that can also be adjusted in frame size and caliber by the operator. All pistols will be produced at the SIG SAUER facilities in New Hampshire. The MHS Program provides for the delivery of both full size and compact P320's, over a period of ten (10) years. All pistols will be configurable to receive silencers and will also include both standard and extended capacity magazines. "I am tremendously proud of the Modular Handgun System Team," said Army Acquisition Executive, Steffanie Easter in the release. "By maximizing full and open competition across our industry partners, we truly have optimized the private sector advancements in handguns, ammunition and magazines and the end result will ensure a decidedly superior weapon system for our war fighters." Ron Cohen, President and CEO of SIG SAUER, said "We are both humbled and proud that the P320 was selected by the U.S. Army as its weapon of choice. Securing this contract is a testimony to SIG SAUER employees and their commitment to innovation, quality and manufacturing the most reliable firearms in the world." Editor's Addendum: The new service pistol is to be known as the M17. Glock (G17 and G19) and SIG SAUER (P320) were the two finalists for the MHS contract that runs through 2027 and is worth $580,217,000. Current Army plans call for purchasing 280,000 new pistols. It is expected an additional 212,000 pistols may be ordered by the other services. SIG SAUER will be responsible for supplying handguns, ammo and accessories.